The Takeaway: Cocktails are pricey and range between £18 to £50 (and up to several £1500 for cocktails made with vintage spirits). Plays to an old-time, classic theme that feels sterile, but the menu is surprisingly innovative. We recommend the Horror Quartet (£50). Unlike the Dandelyan, we had read enough reviews (“stale” and “afraid to wander out of their comfort zone”) about the American Bar that our expectations were muted. But it is also the #1 bar on the World’s 50 Best Bars, so we were insatiably curious how it would really stack up. 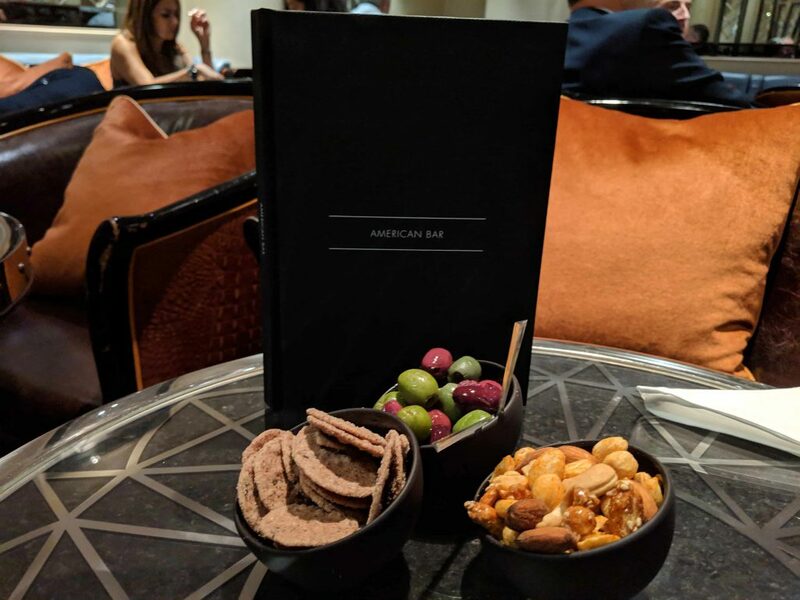 The American Bar is the hotel bar of the Savoy. 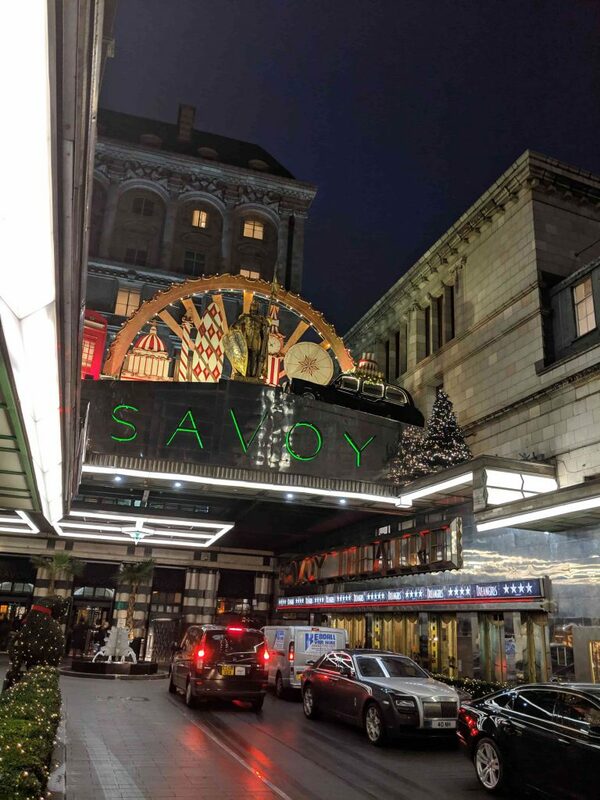 The Savoy. The hotel for which more so than any other hotel, is the one synonymous with opulence and class. 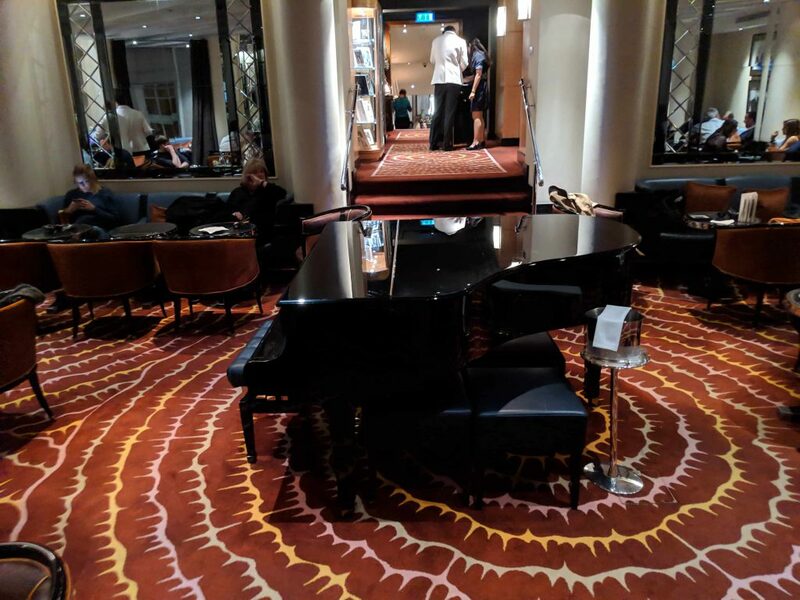 And its grand lobby, which during our visit was decked out in Christmas regalia, was gilded and luxurious, and in a very proper sense as opposed to the unfettered splashiness of a Vegas or Abu Dhabi resort. We were asked to wait for seats at the American Bar and directed to their waiting parlor, which also served as a museum to the early days of the bar, featuring famous patrons and vintage spirits behind glass cabinets that can be ordered as (very expensive) cocktails to experience what others in the past would have received. Only 5 minutes went by before an Italian waiter in a white jacket and gloves escorted us to our seats. Although entrance to the bar requires meeting a dress code (no sneakers allowed), the large portion of the bar area feels like a packed upscale airport lounge – groups are seated cozily in clusters near each other, with coats, shopping bags, and purses strewn about in messy piles. The bar, though stunning, is small and primarily tucked out of the line-of-sight for most of the visitors. I had to boldly stroll up to it to swiftly snap some shots before sulking back to my seat. 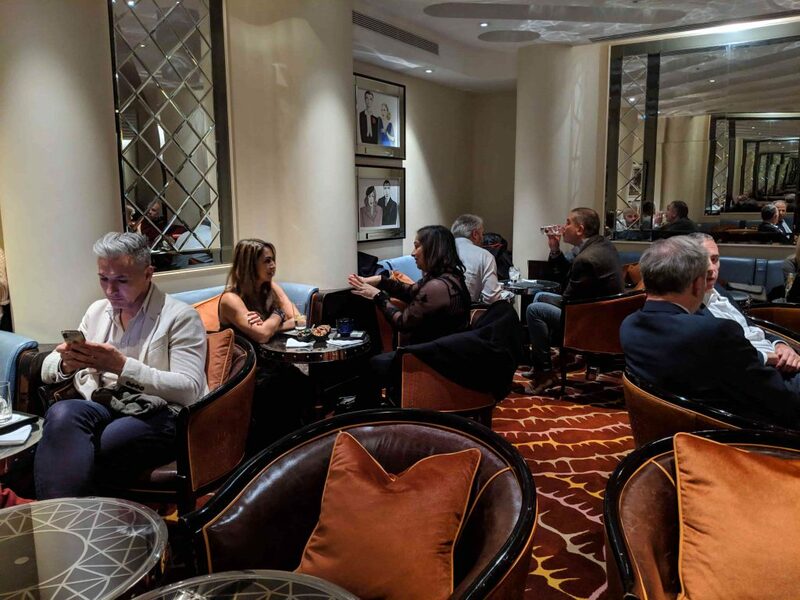 Although everyone is well-dressed, the close quarters makes the lounge feel a bit like an upperclass airport lounge and less like an actual bar. The actual bar area – which is not viewable from the lounge and only seats 4 people. I believe reservations are required. And this is probably where the World’s Best Bar selection committee sat. I would be shocked if they actually sat in the lounge and still rated this as the number one bar in the world. The menu immediately perked us up, however. 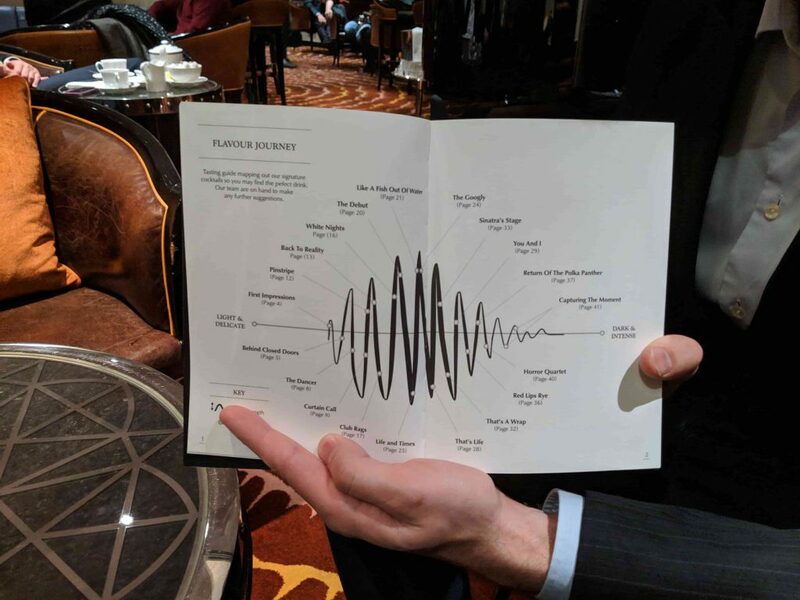 Cocktails are listed from light to dark, and from there, in a musical crescendo and decrescendo, based on the “long”ness of the cocktail. Several ended up capturing our imagination, particularly their rum-based drinks. 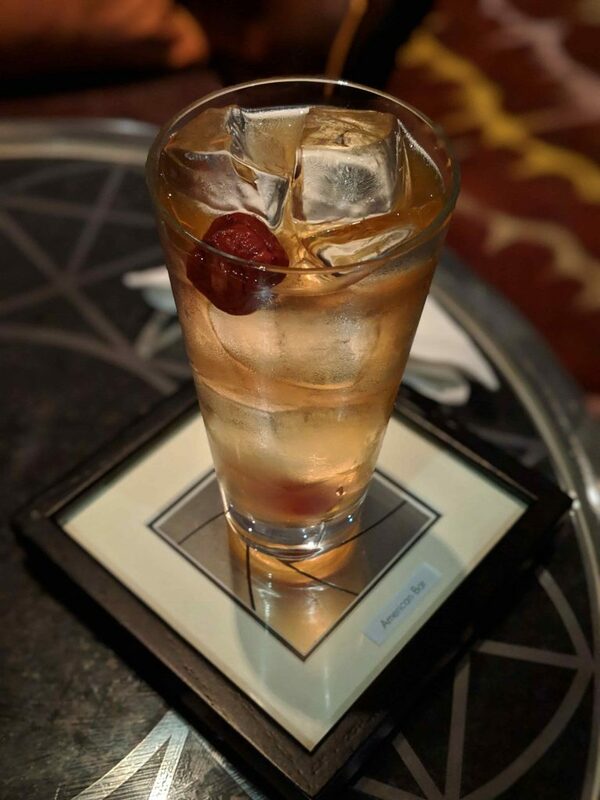 Each cocktail was inspired by a black-and-white photograph, which is depicted on the page opposite the cocktail description. Eventually, a young French waiter donned in the white gloves and white jacket uniform of the bar took our orders, informing us that they wanted us to enjoy the experience “and you don’t need to feel hur-ree at all here”. 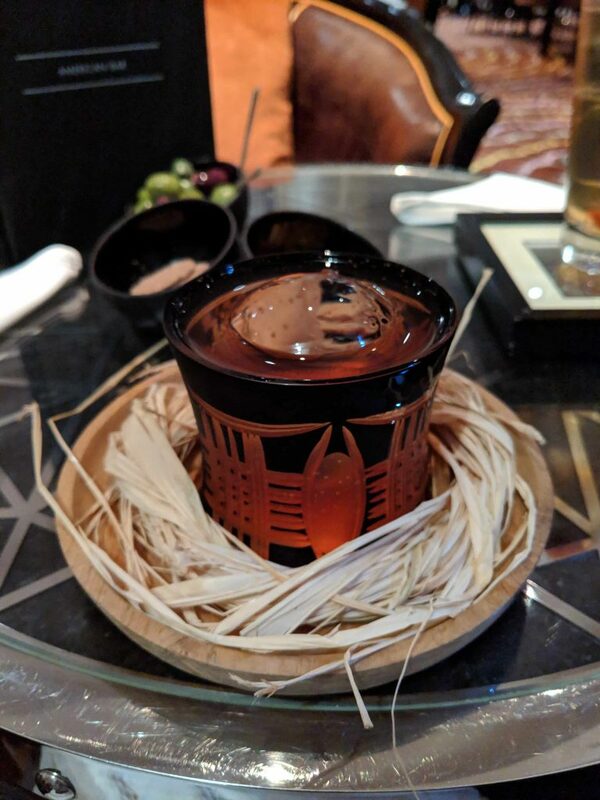 The drinks we ordered were the Life and Times (umeshu and white port, £22) and The Horror Quartet (Johnny Walker blue, truffle honey, and mezcal, £50) were both delicious and well-balanced. In particular, the Horror Quartet, which is unveiled in a small smoke-filled dome and placed within a bird’s nest, is superb and inspiring from a flavor-profile perspective. Less so from a cost perspective. Those were the only 2 cocktails we ordered, however, which was only due to the busy-ness of the lounge that made it difficult to flag down one of the many white-gloved waiters gliding around the room. Our patience ended up running out, which may have also been correlated with the completion of our complimentary bowls of tasty bar snacks. This is not to knock the servers – ours was gracious with his time – chatting with us about our plans and then crafting a list of his recommended bars and restaurants. Had we been able to sit at the bar, I think the experience would have been quite different. But from the average visitor’s perspective, I would hesitate to place this as #1 on the World’s 50 Best Bars, despite liking the cocktails I ordered.